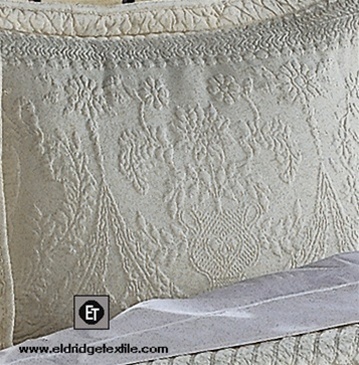 Sale On All King Charles Bedspreads, Coverlets and Pillows! Regularly $39.99 - $229.99, Now $29.99 - $169.99, Sale price will show in shopping cart. King Charles-Timeless elegance, this classic English design from the Historic Charleston Collection will allow you to create a beautiful room without sacrificing easy care. Woven of 100% heavyweight stone washed cotton for a luxuriously soft feel. 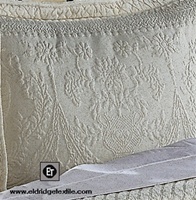 The matelasse' design features a diamond quilted center surrounded by an elaborate border. 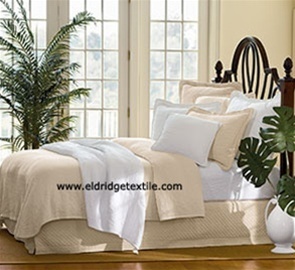 The Coverlet or bedspread will serve as a beautiful bed cover by itself or as an accessory when layering with your favorite print linens. Luxuriously soft and double-woven for extra durability. Using today's most advanced technology of weaving and coloring, this bedspread will surely be tomorrow's heirloom. Machine washable. Imported.